Works with self-hosted Wordpress sites as well as Wordpress.com blogs. Writing and editing posts can be glitchy, not a replacement (yet) for desktop versions. Say you’re enjoying a nice afternoon break after publishing your latest wit and wisdom on your blog, and have decided to treat yourself to a Chocolate Devotion at Cold Stone Creamery. You sit down to enjoy your well-deserved treat, and your phone chirps indicating there’s a new email. You glance at your inbox to see there’s a comment on your blog, and open it to read in horror a comment about a misspelling in your article title. Most would panic at this point, but you’re unshaken. You don’t need to abandon your little midday break to rush home to make the correction. 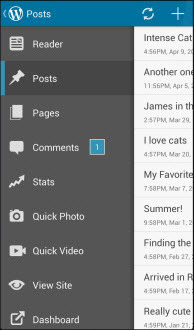 You simply navigate to your article on the WordPress app and fix the title. You even respond to the commenter, thanking them for pointing out the error. Back to enjoy your ice cream before there’s any hint of melting. The above scenario has happened to me before, more than once actually. Okay, I added the ice cream part to make it more dramatic, but you get the point. If use WordPress, the WordPress app is an enormous help in managing your sites. Especially, if you moderate comments, you can respond instantly to readers and keep the conversation going. 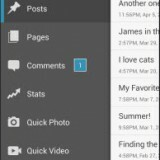 And of course, you can use the app to write and publish new articles. You may find writing and editing easier and more reliable on the desktop version of WordPress. I’ve found that writing and editing with a Bluetooth keyboard helps. The app is still great for quick fixes, drafts and site management. 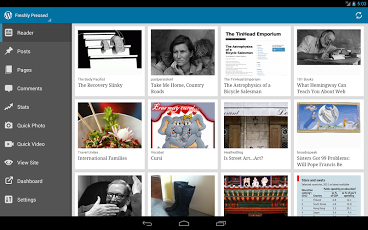 Wordpress is free for Android devices.